Goodmans GFSDTR500HD review | What Hi-Fi? 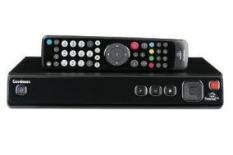 Goodmans' first Freesat PVR is tiny next to its rivals, although its modest dimensions are partially achieved by shifting a chunk of the power supply to an offboard box. It's got a large hard disk, at 500GB – enough for over 300 hours of standard-definition recordings. There's a 320GB version too, but as it's only £20 cheaper, we can't imagine many opting for it. The Goodmans is slick, its on-screen menus and user-interface standing comparison with the best around. Menus are subdivided up into key genre-based categories (entertainment, music, lifestyle etc) to simplify your navigation, and the eight-day EPG is complemented by an array of useful recording features designed to give you the best possible chance of copying what you want, when you want to. In action, both reception and recordings look great: off-air images are perhaps a little softer than the class best, but viewed in isolation, you'll find little to complain about with either picture or sound here, especially with BBC HD images. Colours are vibrant and punchy, while fast motion – ably illustrated by watching the likes of Top Gear – is reassuringly free of smear. The 'DTR500HD's spec is competitive, too: it has both coaxial and optical digital outputs, and also includes an Ethernet port that in the future will be able to stream BBC iPlayer content. However, the fitted USB input is only for factory upgrades, rather than media replay, and there's no display on the fascia, which seems a missed opportunity when compared to the at-a-glance information provided by some rivals. You can't bypass the internal video scaling, either: set the Goodmans to output 1080i video from HD (as you're likely to want to do) and it'll automatically upscale 576i video from standard-definition TV too. That might not be a problem for some, but if you've a good TV or AV amp with superior scaling, you might be miffed. We're also concerned about a simple design flaw: this PVR has a dreadfully noisy cooling fan that seems to run continuously. Concerned that we might have a dud sample, we tried the Goodmans' identical Grundig stablemate, the GUFSDT500HD, where we had the same result. Hopefully there'll be a workaround soon to fix this bugbear, but as it stands, it's enough to push this mostly respectable box down in the rankings.